with a crappily painted background. Updated with a cutie mark! Maybe it could be Pinky's head. More like the spawn of Pinky and Pharfignewton. Phar is a Warner/Horse hybrid. 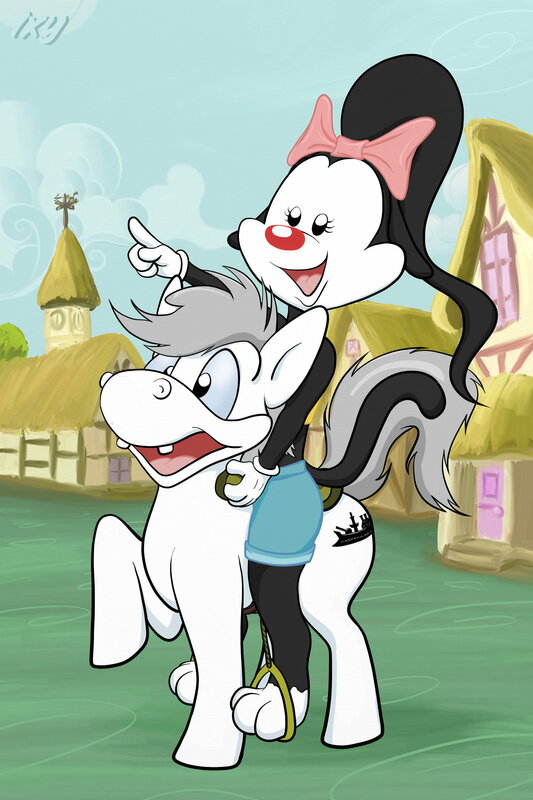 In one fan-fic, where the original cast were being reassembled for a new Animaniacs show, Phar has a hybrid son by Pinky despite a size difference. Also the Warners were separated by legal decree because their being together catalyzed lunatic and destructive behaivor. For the duration of shooting films now,for the new show, they could be together -under guards- but would be housed in different parts of the lot at any other time. No communication or contacts ! Really cute and colorful! :) And I like the background too. Thanks. They just fit with the picture. That's amazing, you did a great job there and it's made my day. Thanks! I'm glad you like it! Also, updated with a battleship! *huggg* I'm glad you like it. It came together pretty easily with just a few hiccups. ‌*huggg* I'm glad you like it. It came together pretty easily with just a few hiccups. The background seems to be the setting of Wakko's Wish, the swan song of the canon Warners. It does look similar. I intended for it to look like Ponyville though.